Just one month old and my Giro Xar was totally written off in a crash on the Verderas Trail in the Forest Of Dean. I went over the handlebars into a huge head-plant that crushed the front of my Xar and split my chin (22 stitches needed to repair the damage). 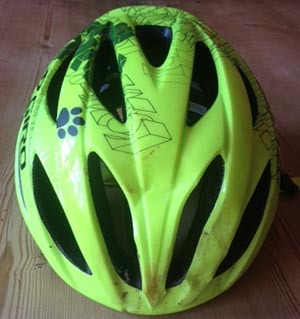 The Xar had been the most comfortable and well-fitting helmet that I’d ever had, sitting low and snug on my head – and aside from some compression to my throat, where the strap dug in, the helmet stayed in place and in one piece throughout the crash. It’s now been replaced by Zyro, the UK Giro importers, for another Xar (albeit white this time) for the reduced cost of £60. Those red smudges on the front are not paint!